I couldn't resist buying a yard of "grape" aka purple Sunbrella from the Doyle sail loft in the BVI's. 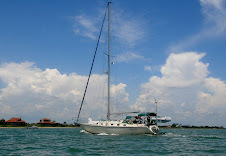 FYI - most sail lofts are willing to sell you fabric and notions and often times will give helpful advice...if they have time and it's not right before race week or some such. 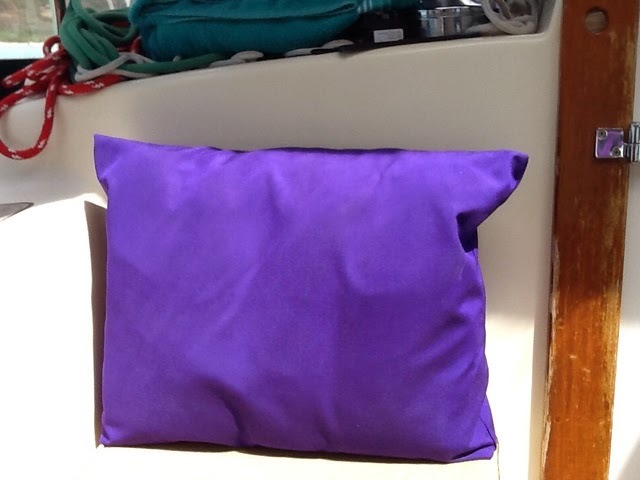 I decided to make cockpit cushions with this lovely purple Sunbrella but I also wanted them to be utilitarian as well. 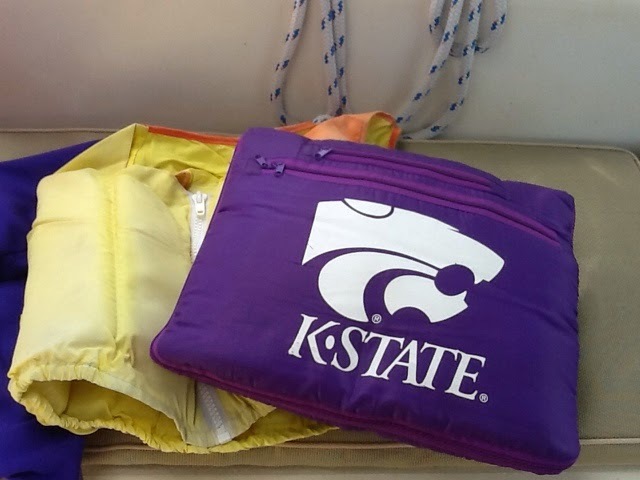 We have two K-State stadium blankets that zip up to make pillows. We often use them on passage in the cockpit to keep the chill off while napping off watch. However, they are not waterproof. No problem, I can cover them in the grape Sunbrella to protect them. To date we have been using a couple of life jackets as pillows. They have come in handy as actual life jackets a couple of times as well. SO....I decided to combine all three for my design. 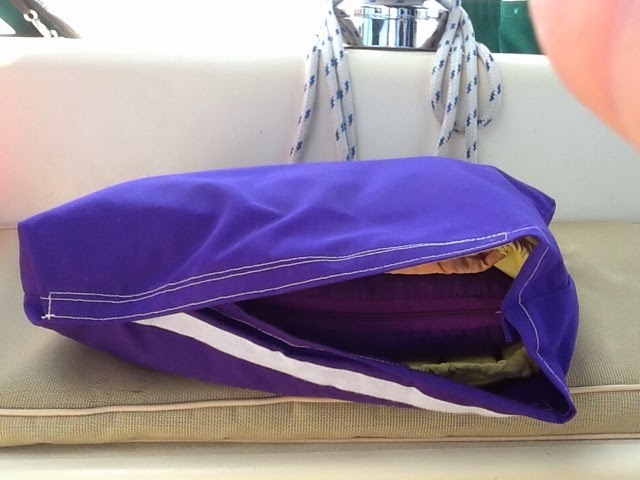 I put the stadium blanket pillow inside the life jacket and then I put those two inside a pillow cover made out of grape Sunbrella. 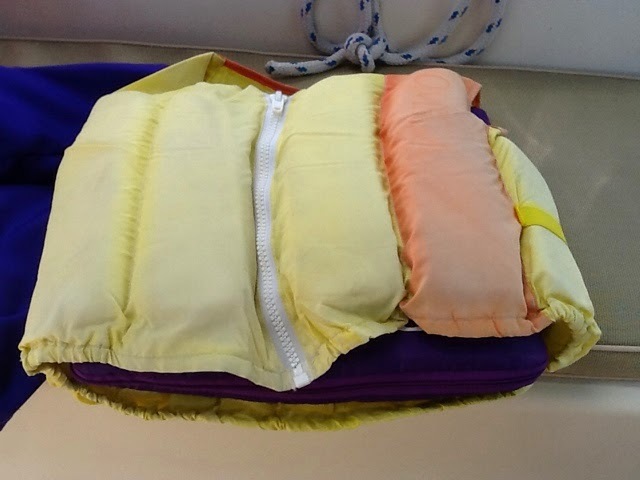 A Velcro closure across the bottom gives us quick access to the life jacket or stadium blanket should we need. Very clever! Of course you know you're not actually supposed to sit on lifejackets as it compresses the buoyant material and eventually can render them useless...or at least that's what I've heard. In practice, it probably takes a long time, and you certainly have extras. Right?! 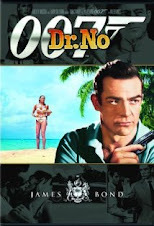 No purple banana hammock for the captain?